Thanks to eBay, you can now buy things all sorts of random things that you didn’t even know you wanted. Here’s a list of various sports-adjacent things we found this week. START YOUR OWN BUSINESS, ADD TO THE ONE YOU HAVE OR JUST ENJOY A HUGE COLLECTION THAT WILL TAKE YOU YEARS TO PROBABLY GO THRU. IT IS TIME FOR ME TO RETIRE FROM COLLECTING SPORTS CARDS!! I CAN ALSO SHOW YOU HOW TO MAKE $1000’S A MONTH EASILY LIKE I HAVE WITH THIS COLLECTION!! BESIDES THE ENTIRE UNSEARCHED ENTIRELY FILLED FROM FLOOR TO CEILING STORAGE UNIT YOU WILL GET ALL THE ITEMS I HAVE CURRENTLY LISTED FOR SALE IN MY AUCTION LISTINGS AND 1000’S OF ITEMS I HAD LISTED THAT WENT UNSOLD IN THE LAST FEW MONTHS ON EBAY!! THE PICTURE SHOWS JUST THE STORAGE UNIT,BUT I ALSO HAVE LOTS OF ITEMS AT MY HOME THAT I WAS GOING TO LIST IN FUTURE AUCTIONS. TONS OF HIGH END MICHAEL JORDAN CARDS INCLUDING SIGNED CARDS AND OTHER ITEMS LIKE A SIGNED PSA/DNA BABE RUTH/LOU GEHRIG YANKEES BASEBALL! EVEN CASES OF TOP LOADERS,SLEEVES,BINDERS,ETC,ETC,ETC!! NOTHING HELD BACK,MY ENTIRE COLLECTION!! In Michael Jordan and other high dollar $ alone,there is probably $100,000 worth of items without counting the storage unit! Players,years,brands,types etc. are from ??? to ???? One of the most dynamic big men to have ever played the game, nothing says “living legend” and “Hall of Famer” like having your own commemorative plate. 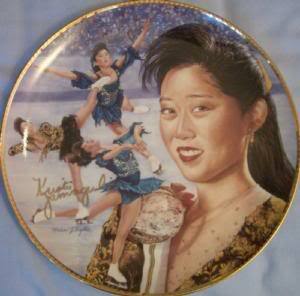 Just ask Kristi Yamaguchi and Tom Selleck (most commonly known as Richard on the NBC sitcom Friends). OK, this one is just awesome. The title says it all, doesn’t it? A photo of Jan Stephenson!!! Sitting against a table!!! Looking!!! But the bigger question here is, at what? What is Jan Stephenson looking at? Is she just surveying her next shot? Maybe. But maybe she’s looking into the future. She’s seeing a day when she’ll be on the 11th season of Australia’s Dancing With The Stars (did you know that Australia has had 11 seasons of Dancing With The Stars? Insane.) only to be unceremoniously kicked out the second week for a subpar samba. Who knows.